More than 400 leading companies use the innovative software solutions of CoreTechnologie. Our customers benefit from an optimal interoperability between different CAD systems and an efficient and loss free data exchange of 3D models between all major CAD systems. Our product line 3D_Evolution does not only include modules for CAD translation but also for geometry simplification. With our Simplifier you can easily create an envelope geometry and protect your 3D models by removing internal geometry effectively. Reliable IP protection at your fingertips. Within secondsyou can protect your intellectual property for all systems and formats by simplifying and removing the internal geometry of the 3D model and also create high quality and lightweight CAD data. At a push of a button the simplifier will create an exact envelope geometry of your models that is a filled solid and also has significantly smaller file sizes. The simplified model is a perfect B-Rep solid of the outer shell, but the interior has been removed through the automatic geometry simplification. Geometry Simplification is an indispensable advantage when sending out the 3D data because your intellectual property is definitely protected against product piracy. When sending data to suppliers, customers or partners the envelope geometry generation is an easy and ultimate way protect valuable know-how. 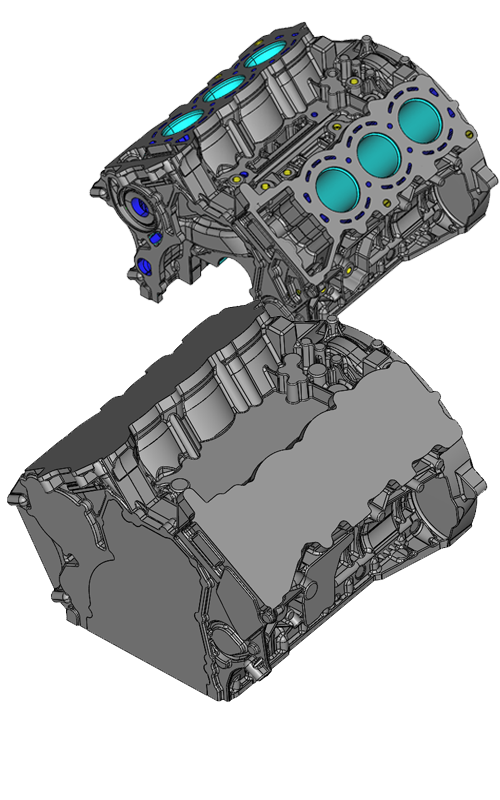 Furthermore the lightweight 3D models can be used in the DMU process or for further processing in the CAD system, for example, drawing derivations of huge assemblies. By our unique simplifier technology interior geometry of 3D models that often contains very specific knowhow will be removed within seconds creating a perfect envelope geometry. The tool is absolutely user-friendly and offers many possibilities. Certain features like fixing holes of the can be excluded from the simplification just by selection or volumes smaller than a defined value can be deleted automatically. All these Option have been developed in close cooperation with our customers in order to offer an entire solution for the task of geometry simplification. For the protection of your valuable development work and for fast generation of "light" models the simplifier is the perfect solution. The resulting bodies are exact solids which can be converted to all major target systems and formats. The calculation of the envelope geometries also allows a significant reduction in the amount of elements and data size and guarantees for damatic increase of the graphics performance e.g. for digital mockup visualization or drawing creation of very big layouts. The envelope geometry generation can be performed in interactive or in batch mode. Furthermore it is easy to integrate 3D_Evolution and the CAD Conversion as well as the geometry simplification process to your existing PDM -Systems. The simplifier thus enables the automatic simplification of large data volumes, complex assembly structures and geometries within the shortest space of time and without any manual effort. The perfect solids can be converted and exchanged with all major CAD formats. Moreover 3D_Evolution is also a certified Daimler JT converter. Saved Files can also be visualized with our cost-effective and powerful CAD Viewer called 3D_Analyzer.